No.5"hermoelectric generator:the hero of planet exploration"
Why Thermoelectric Generator is "Hero"? In this column, I have written that the actual application of thermoelectric generation has began from a camp fire. This time, I would like to talk about thermoelectric generators that have become popular since 1960's for satellites and spacecrafts, acquiring outstanding achievements for mankind. Our solar system still has many unknown facts. Therefore, thermoelectric generators have been playing very important role in the explorations of planets, where the birth history of the solar system would be hidden, such as Jupiter or deeper ones. It is needless to say the vital role of rocket technology and electronics, not to speak of computers, in the spacecraft for planet exploration. But the application of these edge technologies to exploration would have been completely impossible should there not be thermoelectric generator; the power of spacecraft continuously operable for very long exploration periods, sometimes exceeding ten years. So, it isn't an exaggeration to say that thermoelectric generator played the hero's role on the stage of exploration of deep solar system. Today, 2003, space exploration organizations and facilities have made a remarkable progress compared to ten years ago. Human beings are routinely staying in ISS; International Space Station. Although the launch of the Space Shuttle is now suspended from the accident of Colombia personnel shift is conducted by Russia's Soyuz spacecraft. 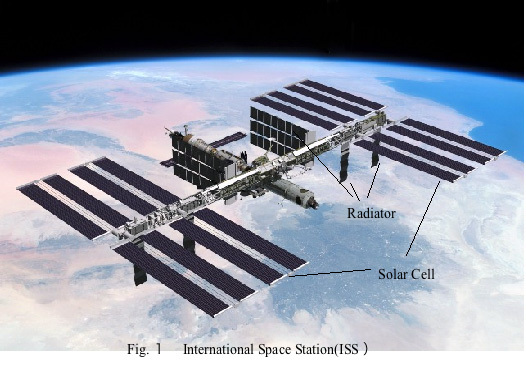 Meanwhile, solar cell is very popular as an energy source in space, and you can easily take a look at the huge solar cell panel on the ISS(Fig.1). But the generation ability of the solar cell decreases in inversely proportional with the rate of 1.5power to the distance from the Sun. (The intensity of Sun Ray decreases in inversely proportional with 2.0 power to the distance from the Sun, while the generation efficiency of the solar cell increases with lowering temperature.) Therefore, if we send spacecraft to the planet farther than the Asteroid Belt(numerous small planets existing at the orbit between Mars and Jupiter) and conduct many observational work, solar cell is no longer effective. There, the Sun Ray is too weak and a simulation indicates we need huge solar cell panels. 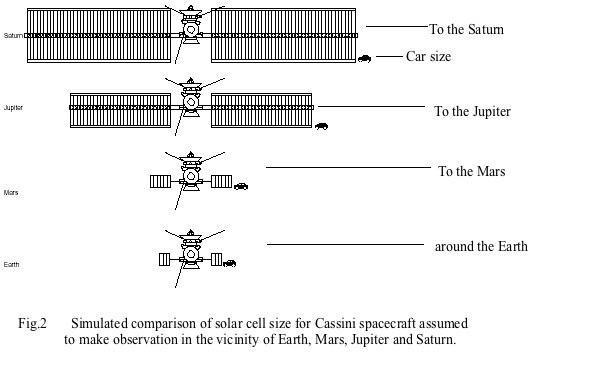 In the case of Cassini spacecraft(Saturn exploration), the simulation in Fig.2 shows the huge solar panels in comparison to the spacecraft's main structure, and it's too heavy to develop a practical rocket capable of launching. 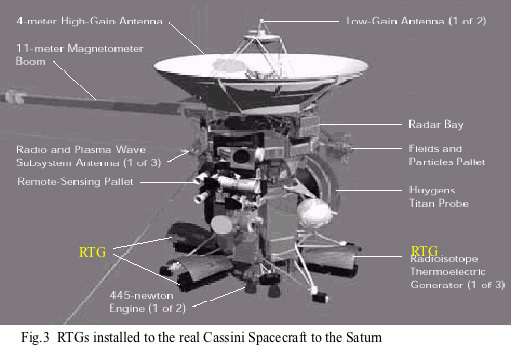 Real Cassini, shown in Fig.3, has three thermoelectric generator modules(RTG:Radioisotope Thermoelectric Generator) powered with radioisotope's heat. She took lots of magnificent pictures like Fig.4. Thermoelectric generator using radioisotope is called RTG:Radioisotope Thermoelectric Generator. The following is an explanation. Radioisotopes, as an energy source for spacecraft, are quite suitable for deep space travel. α-ray and β-ray, radiated during the natural decay of radioisotopes, can be used as an energy source. In the past people tried to use β-ray emitting strontium90(Sr-90) or cesium-137(Cs-137). However, Pu-238, emitting α-ray, relatively safe in handling, has been the most popular radioisotope adopted to spacecrafts, except military satellites. Because, β-ray accompanies γ-ray dangerous to humans with difficulty to shield. The time Pu-238's radiation intensity halves(half-life) is very long, 87 years, it is a sufficient radiation as a heat source for spacecraft, even in an exploration to the end of the solar system sometimes require ten years or more. 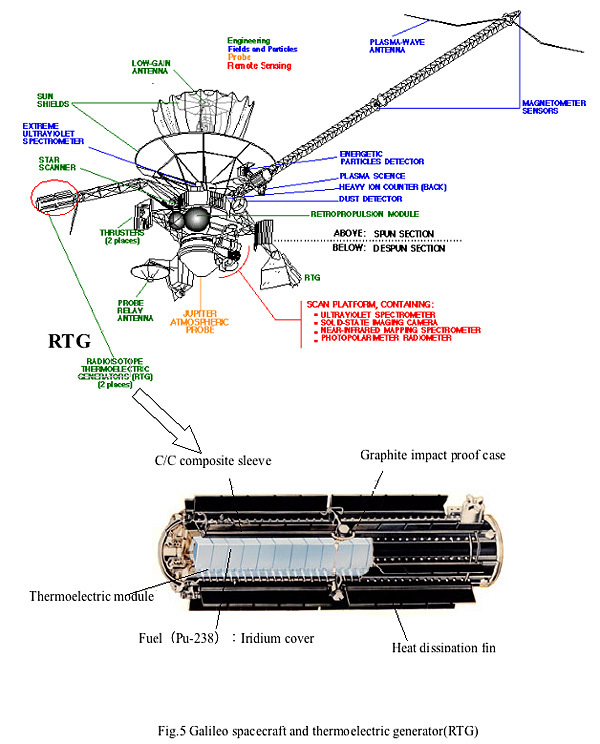 In Fig.5, you can see Jupiter exploration spacecraft "Galileo" and the equipped RTG. Pu-238's α-ray is absorbed by the metal plate which temperature rises to transmit heat to the hot side electrodes of the thermoelectric module. The typical operating temperature at the heat absorption side(hot side) is maintained at 400°C-600°C. The cold side of the thermoelectric module is exposed to space. As the space temperature is 3K(-269°C), you guess a large temperature difference between hot side and cold side, however the space is almost vacuum, then the heat can only be dissipated by radiation. To get an effective heat dissipation by radiation, the hot side fin should be at an elevated temperature from the space. From this reason, heat dissipation side(cold side) is held at 100°C-200°C. Therefore, the temperature difference is 300°C-400°C. Efficiency is 7-8%, similar to silicon(Si) solar cell, but inferior to gallium arsenide(GaAs) solar cell. It took six years for Galileo to arrive at Jupiter since launching from Space Shuttle, October 1989, and additional eight years were needed to continue observation after arrival, Galileo spacecraft ended her life on September 21st 2003 entering into Jupiter's atmosphere. Voyager has flown away beyond the solar system and her RTG continued to normally work for 20 years or more! Historical order of material systems used for RTG is bismuth telluride(Bi2Te3) first, then lead telluride(PbTe) and finally silicon germanium(SiGe). SiGe, with large achievable temperature difference and relatively high efficiency, is the most popular material system adopted to planet exploring spacecraft mainly operated by U.S.A. Planet Exploration Spacecrafts Launched by NASA, U.S.A. Since 1972, JPL(Jet Propulsion Laboratory) of NASA(National Aeronautics and Space Administration) in the United States has actively launched planet exploration spacecraft named Pioneer(1972,1973), Voyager(1977, two crafts), Urysses(1990), Galileo(1980) and Cassini(1977). 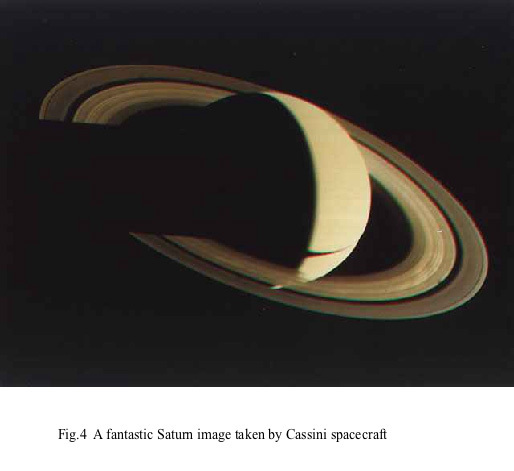 These spacecrafts explored Jupiter and Saturn as well as their moons, some of them farther investigated Uranus, Neptune and Pluto, succeeding in obtaining a lot of valuable information about the origin and present state of the deep solar system which couldn't be obtained by telescopes. SiGe RTG with Pu-238 heat source supplied electric power for all these spacecrafts. 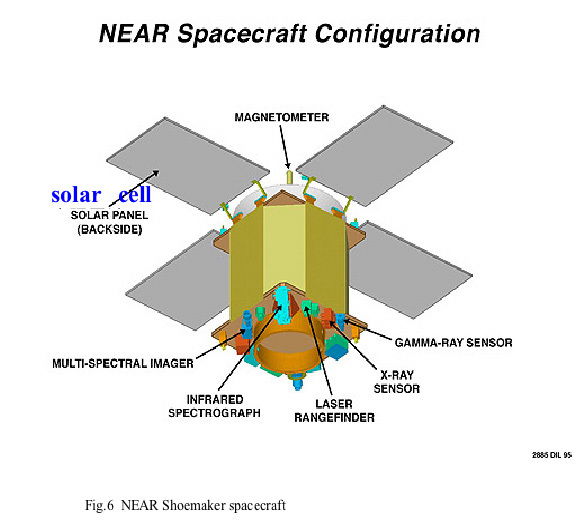 As the sun-ray is sufficiently strong to the Asteroid Belt and solar cell is still effective there, spacecraft NEAR Shoemaker, launched in 1996, adopted a combination of gallium arsenide(GaAs) solar cell and nickel cadmium(NiCd) secondary battery(Fig.6). This spacecraft rounded asteroid Eros(Fig.7), second largest(13×13×33km) near-earth asteroid, for a year making many kind of observation, eventually made a soft landing on this asteroid. Comparing Galileo(Fig.5) with NEAR Shoemaker(Fig.6), relative size difference of power source to main body between the two spacecrafts is apparent. Galileo's thermoelectric generator(RTG) looks quite neat and compact! RTG with Pu-238 heat source has a very rugged structure shown in fig.5 to assure safety. This is because of a concern for dispersion of Pu-238 following the destruction of spacecraft in earth's atmosphere then posing a significant damage from α-ray when Pu-238 is inhaled into human body and other creatures. Especially, the maneuber called "swing-by" in which spacecraft approaches Earth to accelerate it's speed by using Earth's gravity is cautiously planned to prevent destruction in the atmosphere. NASA has been conducting earnest educational activity about safety of RTG. The well-known professor Carl Sagan of Cornell University, who positively supported extra-terrestrial life investigation, contributed a supporting article to USA TODAY newspaper. Galileo spacecraft was put into the course to enter Jupiter's atmosphere to prevent a collision with Jupiter's moons where life may be possible to exist. Note: All figures are referred to NASA and other homepage. Author inserted explanation words in them.